Alas, 2008 was the last of the Wurts Street parties - changes in family, relationship. I'm currently living in Florida and there are plenty of musical get togethers, but the Wurts street parties will live on in history and legend! 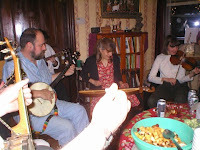 On Saturday, January 26, 2008 the Lusk family had our Annual Mid-Winter Folk Music Party at 61 Wurts Street, Kingston, New York. It went from 6:00 p.m. and ran until 5:oo in the morning. In 2006, a weeks before the party I jotted down a few whimsical thoughts about the way the party usually flows. Following are the results of my predictions or comments on what actually happened in 2006, 2007 and 2008. Prediction 2006 - 6:00 pm - Two or three people arrive during the first half hour and tentatively take out their instruments (guitar, banjo, accordion, etc.) and try to play a few songs in the living room. Usually at least one will be inexperienced in playing with other people. 2006 comment - The first person to arrive was mandolin and dobro player Andy Bing. He is one of the best musicians I know. The other people who came in quickly after him were also good musicians. By 6:30 some excellent music was being played. 2007 comment - Andy was first to arrive again, shortly followed by banjo legend Roger Sprung. I was trying to tune a hammered dulcimer, but quickly gave up as the stand up bass player was tuning up The party started with a bang as we sang "Love , Oh Love, Oh Careless Love". And we were off! 2008 comment - Andy came first again, about 6:10. Others trickled in. I showed off a few of my new instruments and my autographed Pete Seeger banjo resonator. The music started about 6:30. Enough socializing already! Prediction 2006 -7:00 pm - Enough people are here and playing that 1-2 of them start to move into the dining room. 2006 comment - Prior to 7:00 Ernie Shultis was playing his highland pipes in the living room. This was by request but it did seem to move some musicians towards the dining room which was being commandeered by talkers and socializers (can’t have that!). 2007 comment - Ernie wasn't feeling well and had to leave, several other bagpipers who were planning to come did not make it. Bagpiping was sorely missed this year and something will have to be done about that next year! 2008 comment- Roger Sprung and crew came in and went into the dining room. We shut the door between the two rooms and had two sessions going in short order. Ernie didn't bring his highland pipes but played small pipes most of the evening. Prediction 2006 -8:00 pm There are two very nice sessions going in two rooms and then the crowd starts coming in..
2006 comment- That happened by 7:30 this year. Prediction 2006- 9:00 pm There is music of all kinds going on in the living room, dining room, kitchen and basement. This doesn’t count the 12 kids upstairs playing computer games or watching TV. 2007 comment - The basement didn't get going for awhile. When it did, it was mostly an old-tymey fiddle session with Earl and MaryAnne Pardini. Music in the kitchen did not really get going until 12. Too many people talking and socializing. 2008 comment- Roberto had cleaned up the attic and did computer games and guitar hero with his friends freeing up another jamming room on the 2nd floor. Their was fiddling in the front room 2nd floor and music happening all through the downstairs and basement. Prediction 2006 -10:00 pm Other groups form in hallways, porch, closets, etc. Comment 2007 - Yup There was pretty good hallway action going on all night. It was pretty cold for the front porch, but there were a few people out there. As usual I floated around a bit. Sang some Phil Ochs in the living room, played old tymey in the basement, sang some sloop songs in the kitchen. 2008 Comment - Gridlock happened early this year. Prediction 2006 -10:30 Gridlock. There are 50-100 people here. You won’t be able to move from where you are for awhile. Relax, enjoy. Comment 2006 -Actually gridlock didn’t really happen this year except in the upstairs front bedroom where Earl Pardini, Andy Bing, Jerry Oland and the Whistances kept a bluegrass old tymey session going most of the night. I had people put their instrument cases on the porch this year, which helped keep the hallway clear. Comment 2007. There was some resistance to putting cases on the porch as it was very cold. Gridlock did happen, though probably not from the cases. My fun instrument of choice this year was my new Regal Dobro. The Whistances, Jerry Oland and Les Herring did not come this year. They were sorely missed. 2008 comment. The Whistances and Les came, but Earl and Mimi didn't. I hung out in the basement a lot as it wasn't crowded. Sang for Michelle and Kristen. Comment 2006 - 10:45 The police came because some unknown neighbor had complained about the noise. Jim Donnelly very nicely sent them on their way. Comment - 10:45 - No police. About midnight Jim Donnelly looked from the kitchen towards the front door and said "Uh, oh, here comes trouble". It was only Pat Keating arriving. Prediction 2006 - 11:00 The New York City contingent (Bob Horan and Pat Keating) arrives and the party switches into overdrive. Comment 2007. Bob didn't get here until 1130, Pat until 12:00. Comment 2008 - Bob got here early but wisely spent some time resting up in his car. At 12:30 I was lying in my bed playing the banjo along with Bob and Pat while several people tried to get me horizontal, telling me my wife needed me in the kitchen. I resisted, as I was just too comfortable, both physically and emotionally, but couldn't resist when Annie "Apple" Roland asked. (I'm a sucker for a pretty face/beautiful voice.) When I finally reached the kitchen the jazz combo there (focused around Rusty Boris on bass) played the Beatles version of "Happy Birthday" for me followed by the traditional Happy Birthday song and a great chocolate cake. Comment 2007 . People were saying "This year was the best"! I tried to play some harmonium upstairs on some old tymey tunes. Prediction - 2006 -1:30 The crowd thins slightly and musicians get down to some serious folksinging/fiddling. Comment 2007 -Dobro maven Andy Bing gave me a few pointers on my new Regal Dobro upstairs. About 2:00 I observe that there is a huge crowd in the hallway and no one in the kitchen, so I got Bob Horan into the Kitchen. I don't remember what we played. 2008 comment - A group of young people come in with bongo drums. They look around with amazement and disbelief and then park themselves on the floor in a corner of the kitchen, playing along with whatever they can. Comment 2007 - We had to take the car keys from someone and drive them home. Fortunately they were local. Gina played the piano in the living room, Marty was playing in the living room, Andy and Steven played dobro and fiddle upstairs, Bob, Pat and Jackie were still playing in the kitchen. 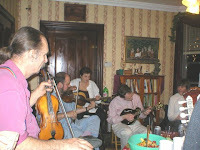 2008 comment - I make Ernie Shultis play his mandolin along with my button acccordion. An energetic bohdron player and jazz piano player try to follow. It actually sounds a little like Irish music. Prediction - 2006 -3:00 My wife sneaks off - later is seen sleeping. Comment 2006 - She actually stayed up til 4:00 this year. I went to bed at 3:30 myself. Comment 2007 - We didn't get to bed until around 4:30 - 5:00. 2008 comment - She barricaded herself in the bedroom about 3:30. My body has failed me and I can't play anymore, but I listen with my eyes closed to Bob, Pat, Linda, Rick and Donna in the basement - it is wonderful. Prediction - 2006 -4:30 My good drunken friends just want to do one more song. Comment 2006 - Jim and Ira helped clean up and then went down to the basement. Comment 2007 - People left. I think they had partied hard and it was cold out. 2008 comment - The music was still going strong in the basement and dining room. I hated to do it, but asked George Kevenson to stop playing the piano - it sounded great - because people were trying to sleep on the second floor. Comment 2006 -At 5:45 I went downstairs and asked people to leave except for Jim Donnelly and Ira McIntosh, who were staying over, and continued playing until 7:00. Comment 2007 - We were sleeping but were awakened at 9:00 AM by a friend coming back looking for his car keys. 2008 comment - People left by 5 AM except for Jim Donnelly who used the couch. Good friend Jim helped clean up, but Penny did the bulk of the cleanup while I slept the sleep of the very contented. Prediction - 2006 - This year I would very much like to have some space for my Kirtan chanting friends. There is a room upstairs that I am going to try and fix up with pillows, altar, etc. Not sure how quiet it will be. And of course since this is an open party, it is hard to control such things, and the banjo or harmonica players could very well take it over. Comment 2006- It was the banjo players that took it over. Probably unrealistic expectations on my part. It would be like trying to do a Catholic mass at a rock festival. Several of my Kirtan friends came to the party, but no one seemed disappointed! Comment 2007 - Only a few Kirtan friends and one member of my Hindustani classical music class came, but they all seemed to have a good time. 2008 comment. My good friend from Kirtan, Prema, asked me to do some Kirtan with her in the basement. My harmonium was within reach, so we did "Sita Ram" for about 5 minutes. It felt wonderful. Thank you Prema. Looking back the main structure of the party went as usual. Usually we estimate about 50-75 people at the party. This year we hit 100 easily. We bought way too much potato chips and similar junk food, beer and soda. At the last minute we had trouble getting things together and were still doing domestic chores when the first people arrived. This was probably due to our Florida trip the week before. There is no way of taking in the totality of a party like this. There were 100 people interacting in about 8 main spots in the house over the course of 13 hours. High points for me were jamming classical music in the basement with Eric on classical guitar, Ethan playing with more jazz/rock technique and me on cittern; Sitting in with the bluegrass stuff upstairs; Regrets were not playing enough with Bob Horan and Pat Keating in the kitchen. Penny's father, Sam Boyce had passed away the morning of the party 1/27/07, due to a long illness. He was a standup kind of guy who loved all types of music and had been to the party in previous years. It wasn't exactly in his honor, but we certainly felt we were doing him no disrespect. There were again about 100 people during the course of the evening. A few favorite people left earlier than I would have like, probably due to the crowd. A few good friends were not able to make it. The teenagers had a good time upstairs playing the new Nintento Wii and Dan Schiavettas family seemed entranced by my sons' old Nintendo system. The evening was as usual, filled with all types of acoustic music including folk songs, bluegrass, old tymey, lute playing, blues, pop folk, 60's folk, Kingston Trio, etc. There were two standup bases, two washtub bases, at least 7 fiddles, 5 banjo players, 2 dobro's 2 harmonicas, a harmonium, 2 autoharps, a hammered dulcimer,Appalachian dulcimer English concertina, Anglo concertina , banjo ukeleli, and about 25 guitars, including several 12 strings and my 24 string slide guitar. Summary 2008 It's hard to compare year to year, but I don't think we've ever had a better party. It just felt great. The level of musicianship seemed high, but I don't think any "amateurs" were discouraged from playing. I think I missed more of it, just because there was more going on. I felt very loved by family and friends, the music was great and their was a great variety of it. Someone asked me recently when the yearly party first started. I think the first really big party at 61 Wurts Street was following the launching of the Woody Guthrie, the sloop Clearwater's brother ship, roughly 1977. (Many musicians had lived in the house before I first moved there so it's possible the house has an older partying history that I am not aware of). We had Morris Dancers, fiddlers, sloop singers, an Irish ballad group and just plain old partying type musicians. This type of event seemed pretty normal to me, although usually on a smaller scale. My social life started in my late teens in the folk music scene in Washington Square park in the 60's. We would sing in the park and then go over to someones apartment for more singing. I had a folk group in the late 70's, "The Floating Coffeehouse" that seemed to be a traveling music party. Frequently we got together at Wurts Street and the number of musicians just seemed to grow. In the early1980's I was in a studio apartment in Brooklyn and had several music parties that might have been smaller, but were just as lively. In the late 1980's I moved back to Wurts Street and started "The Folkloric Music Association". We had classes and jam sessions every week. Most nights there was something going on. Every month or so we would have a large party. Christmas, New Years, Valentines, whatever the occasion. When I settled down with my family 1n 1987 we moved the Folkloric events out to public spaces such as church parish halls. Looking back at old appointment books, it looks as if I had a party in 1990, but not 1989. I know I've skipped at least one year since then, because I remember regretting it. In 2005 we had a huge snowstorm which delayed the party a week. Earl and MaryAnne Pardini, blessed with 4 wheel drive, came anyway the original night, with 2 fiddler's from Canada. December 30, 2006 a young woman guitarist showed up looking for this year's party 1 month early!